Citizens have until November 15 to debate the new constitution in participatory meetings. Oct 4 (teleSUR) For journalists at the weekly Invasor of Ciego de Avila, promoting the right for Cuban expatriates to vote is central to the debate about Cuba’s draft constitution. Katia Siberia Garcia, who earned the Juan Guadalberto Gomez National Journalism Prize twice, suggested that Cubans temporarily living abroad should be allowed to vote in embassies and consulates. “That would give even more strength and legitimacy to the Cuban electoral process that has been characterized by its grassroots democracy,” said Garcia. On September 28, President Miguel Diaz-Canel met with Cuban residents in the United States who welcomed the government invitation for Cubans residing in foreign countries to join the constitutional dialogue. Roberto Carlos Delgado Burgos, director of the newspaper, is particularly worried about animals’ rights, and said protecting them would promote respect and tolerance among humans. Developing laws to protect animals and punishing those who harm them would prevent this such violence in others walks of life, said Delgado, such as education institutions and homes. Other discussion topics include retirement. Alexei Fajardo Lopez, coordinator of the newsroom, said the draft was not clear enough and proposed adding Article 75, related to the right to a decent job. Mayelin Ojeda Torres, member of the Provincial Office of the Communist Party, was present at the discussion and took note of several points, including wealth, different types of discrimination, artistic freedom and government structures. Invasor, a weekly publication and news website, is based in the central Cuban city of Ciego de Avila and is mostly dedicated to local news. 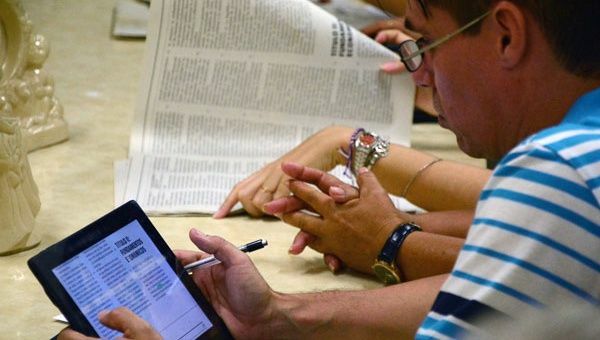 The draft constitution was made public online and hundreds of thousands of copies were distributed across the island in an effort to include as many voices as possible from different sectors of Cuban society. Citizens have until November 15 to publicly debate in over 135 participatory meetings throughout the island. The final version is expected to be voted on early 2019.